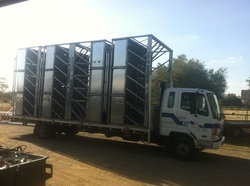 These feeders are made by Weweld Steelworx 60 McEwen Road Kyabram www.weweldsteelworx.com , they can be freighted anywhere in Australia, please note that they are a bulky item and may be expensive to get to some areas however we believe the expense is worth it, our product is completely welded, nothing is bolted or tek screwed together (except for the zincalume corrugated floor). We have feeders from Albany WA to Maffra in Gippsland to Emerald in QLD, we will happily quote delivery anywhere in Australia. We attend most of the field days in southern Australia, Elmore, International Dairy Week, Korrumburra, Sungold, Australian National Field Days so come and see us and have a chat about your needs. Delivering 4 new feeders to the Ballinger farm near Warrnambool Vic, after attending the Sungold Field days and looking at all the options available in hayfeeders they chose the Bale Up Hayfeeder system to set up their new feedpad. They appreciated the hay saving ability, extra length of our feeders and the extra strength, The feeders will be set up to "lead feed" the cattle with round bale silage as they leave the dairy.